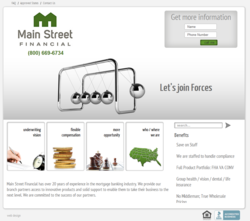 websonalized.com announced that it is redesigning Main Street Financial's website. The revamping of the company's website is intended to awake the interest of mortgage professionals over net branch opportunities. The understated web design aims to make it easy for visitors to get a glimpse of the company's essence. The redesign of the website was made in an effort to compliment Main Street's marketing efforts. The slide show, modules, and listing of benefits are brief and to the point, "flexible compensation," "no need for audited reports," "group benefits," etc. The website's condensed message reflects Main Street's promise: through a willing and knowledgeable support team the company takes over time consuming and required tasks in order to enable mortgage professionals to focus their efforts where these matter most. The central theme of the website is the benefits of partnering with a net lender. The main slideshow images and tag lines evoke the frustrations experienced by mortgage professional when dealing with conventional lending companies. Veronica Cisneros, lead web designer and developer at websonalized.com said: it took us a bit of time to grasp Main Street Financial's vision for the design. After rich conversations, we understood they wanted a design that embodied a strong and productive broker-lender relationship; then, we began to code the concepts. The website has been optimized to be found by professional's looking for net branch opportunities. Websonalized.com offers all clients search engine optimized websites, 1 year hosting, $100 credit Google advertising, 1 year basic support and maintenance, and social media integration with any web design package. For inquiries or questions regarding services and pricing for these web services, please fill up this form: http://websonalized.com/contact-us-site-administration.html. Los Angeles web design company gives businesses the tools to manage their sites and teaches business owners standard practices to gain visibility throughout the internet. The company's mission is to build effective websites for its clients. All through the design and development process, the company proactively seeks to provide clients with value through the teaching of how to leverage internet resources to complement the clients marketing efforts. Main Street Financial is a private, direct, nationwide mortgage banker. Their philosophy is simple, to provide loan originators with competitive pricing, cutting edge technology, and a fast, competent underwriting staff. Main Street Financial partners with seasoned mortgage professionals who want to be independent, yet have access to all the tools, knowledge, experience, and financial resources of a leader in the mortgage industry.